Restaurant Mogul Michael Weinstein’s Offspring to open Chuck & Blade and Bun Bar in Donatella’s old Prova spaces. Sam Weinstein, Michael Weinstein, sister Emma, with Chuck & Blade partner Lukas Pascal. 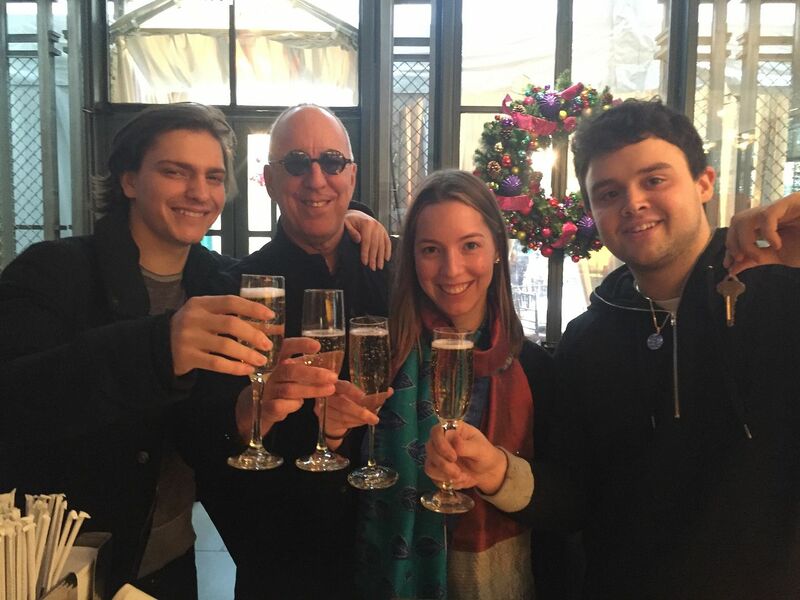 Restaurant progeny Sam Weinstein, 21, and his sister Emma, 25 will team with dad Michael Weinstein’s longtime Ark Restaurant partner’s son, Lukas Pascal, to open Chuck & Blade, a more casual steak house on Eighth Avenue where Donatella Arpaia’s Prova pizzeria has evaporated. The team’s two executive chefs, Viko Ortega and Armando Cortes, will also be partners. 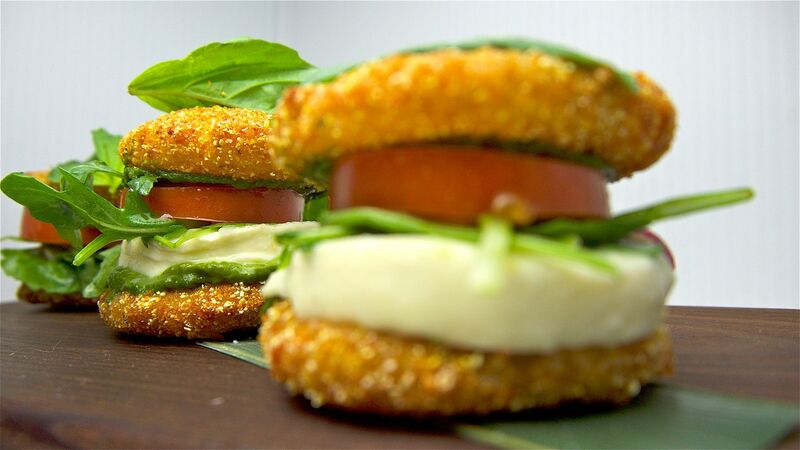 The Ark scions’ Bun Bar will feature Caprese salad slider on green tomato. Sam Weinstein says that most beef cuts will be $40 or less, though imported grass-fed cuts cost more. At first, it sounds like a riff on Quality Eats in the Village, where steak mogul Alan Stillman’s son Michael sells all his steaks for $29 or less. And then, it doesn’t. Shrimp tempura slider with hoisin on a bao at Bun Bar. This next generation trio will also install a sandwich shop called the Bun Bar on West 19th Street in Arpaia’s former D Bar. 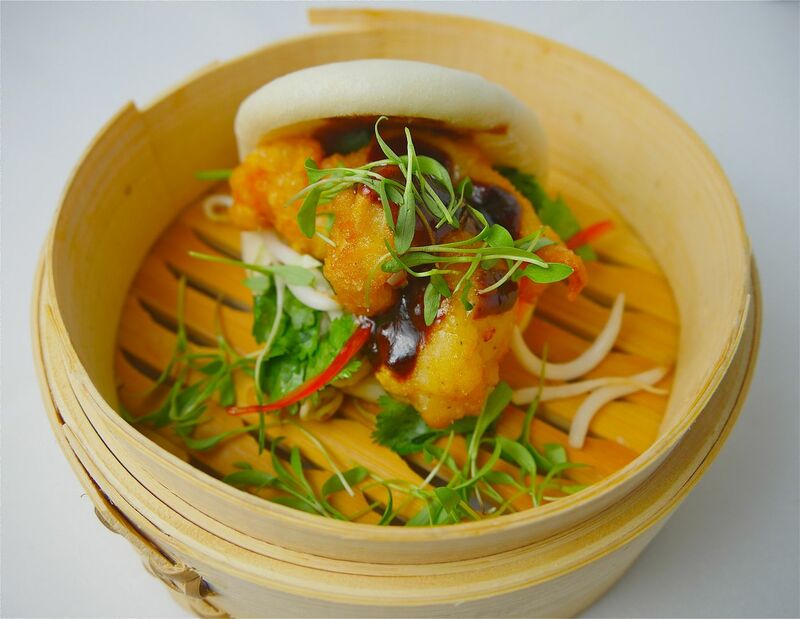 Sandwiches (from $11 to $19) include a Caprese salad slider on fried green tomato and a shrimp tempura slider with hoisin sauce served in a Chinese bun. The bar will also offer salads, burgers and milkshakes. They hope to move into both spaces in late April or early May. Papa Weinstein’s Ark restaurants, a powerhouse of feeding in the late 70’s and 80’s, has been opening and closing restaurants since November 1975 when he launched Museum Café on not-yet-gentrified Columbus Avenue. Ark, now a publicly held company with the senior Weinstein as CEO, owns and operates 20 restaurants and bars plus 21 fast food concepts and catering operations, primarily in New York City, Florida, Washington D.C. and Las Vegas. Donatella’s original pizzeria with its gold lamé oven was a hit in 2012, at least in my BITE. (Click here to read, “Diary of a Donatella”.) Briefly she was distracted by life crises and leased the two spaces to another operation that was not successful. Arpaia came back in 2015 in cahoots with über-Neapolitan Maurizio Derosa, a partner at Sushi Nakazawa, and Pascuale Cozzolino of Ribalta to create Prova. 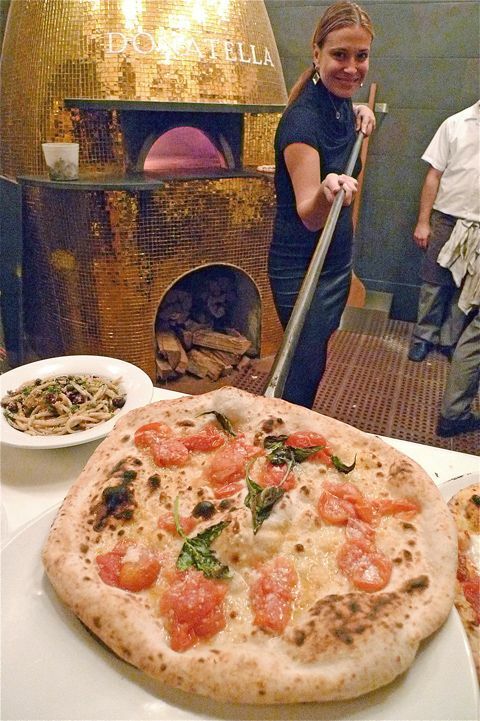 Derosa had a maven fly in from Naples to redo Donatella’s oven in red, and ordained a strict regime for the pie dough. 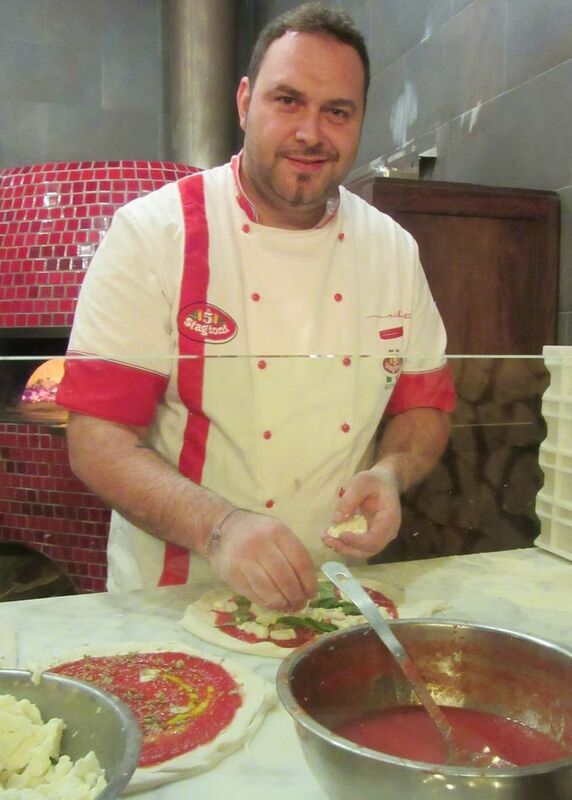 Prova Partner and Executive chef Pascuale Cozzolino will join Arpaia at Grand Central Pizzabar. As soon as he left town, Donatella and executive chef Cozzolino added a couple of excellent pastas to the menu as well as meatballs and salads that Derosa had disdained. (Click here to read: “Prova: Pizza with a Side of Meatballs.” The partners, unhappy at having no sidewalk space. they say, suddenly shuttered. Donatella with her Ribalta partners won a competition for a space on the concourse at Grand Central Station – wood-burning ovens forbidden. They will open Pizzabar with rectangular pizzas July lst. 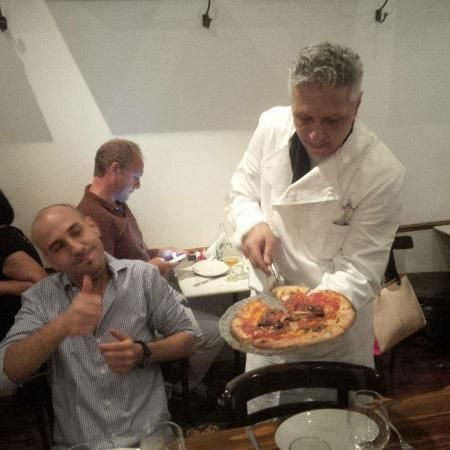 Maurizio says he’s loving his role as on-site pizza proprietor at San Paolo Pizzeria in Buenos Aires. San Paolo Pizzeria. 1616 Uriarte, Buenos Aires, Argentina.